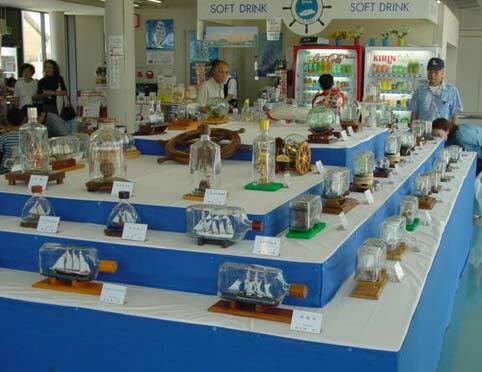 The JSIBA was founded by the late Mr. Juzo Okada in Osaka, Japan in 1978, and it has been promoting the art of building model ships in bottles throughout Japan . The JSIBA has about 200 members and its door is always widened for any Japanese ship-modeler's, either enthusiasts for scale-ships or for ships-in-bottles. If you want to join the JSIBA, contact us anytime at the office above. You will need to pay the membership dues( \8,000 a year ) to be registered as one of our club's members. 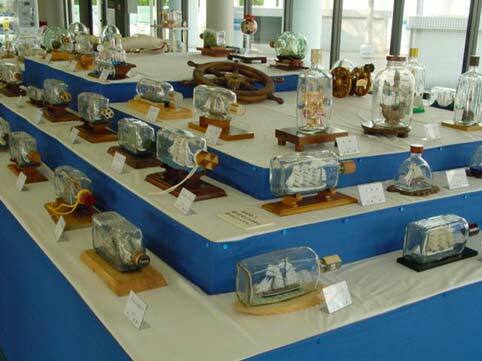 The journal of the JSIBA titled, " THE SHIP BOTTLERS " is to be issued to each member three times a year. In addition, each registered member will automatically receive a subscription of this journal. "THE SHIP BOTTLERS " contains valuable information on how to build ships, or introduces new ideas, techniques, tools, and many items of news about various activities of the association members. Our club regularly holds art exhibition in Kobe, featuring the latest works. Occasionally in some other cities in Japan we hold exhibitions as well. Many new works of art built by the members of our club are displayed at our own gallery in Kobe, and they are also featured on TV as well as in newspapers. 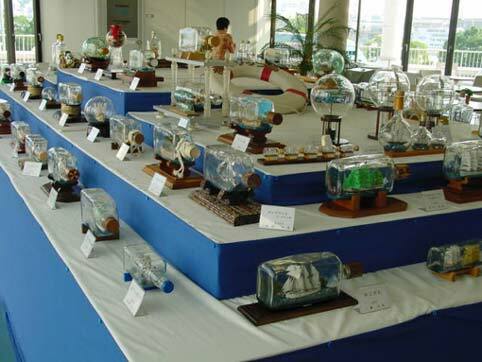 The exhibition for 2004 was held at the Kobe Maritime Museum on July 18th through August 1st. The Kobe Maritime Museum is located in Hatoba-cho, Chuo-ku, Kobe-shi, Hyogo. The other art exhibition for 2004 was held at the hall of the Takatsuki Lifelong Learning Center-Building on August 23th through 27th. The Takatsuki Lifelong Learning Center-Building is located in Momozono-cho, Takatsuki-shi, Osaka.